Calling all stars! All singers and dancers! This workshop allows students to act in a full-scale Broadway-style musical of their very own! Students work with the faculty to create their own story and characters, write scenes, lyrics, and musical themes of songs. Songs, based on student input, are composed by a professional composer. Once the writing is done, the rehearsals begin. 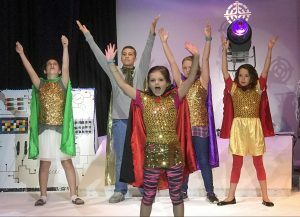 The young actors work with the director, voice coach, and choreographer to put together the show. When all the pieces come together, the result will be a weekend of world-premiere performances.